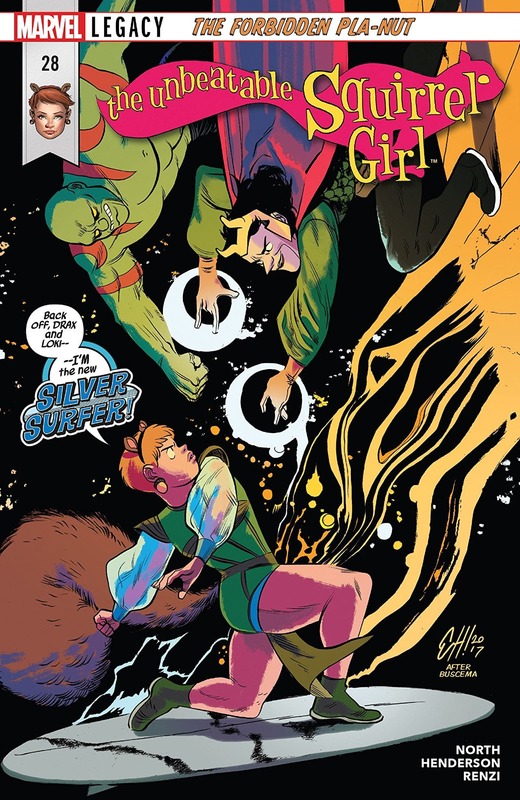 The Unbeatable Squirrel Girl #28 Review – AiPT! Will Squirrel Girl, Nancy, Tippy Toe, Loki, Drax, and an entire planet of squirrels be able to withstand the coming wrath? Have I mentioned in my reviews of The Unbeatable Squirrel Girl how much I appreciate the social media thread recap page? It’s one thing to do a traditional recap. It’s quite another to continually put together a funny, in-character Twitter feed with multiple characters AND maintain those Twitter handles in real life. Seriously. Go tweet @unbeatablesg . I’ll wait. Did you do it? Good. On with the review. When last we left our intrepid heroine, she had been trapped by the dread Dormamu while on her way, via the power of Loki, Sorcerer Supreme, to rescue Nancy and Tippy Toe from wherever they were across the galaxy (see, funny recaps are hard). While I saw Stephen Strange’s unique method of taking out Dormamu in the film Doctor Strange as a pretty slick move, I was wholly unprepared for Doreen defeating yet another grand universal terror. Is there a cork board somewhere in Marvel HQ where people stick up the most insane methods of defeating impossible terrors? Does Ryan North spend his free hours just trolling through Wikipedia holes looking for these things? Has Erica Henderson’s hand recovered from drawing several million squirrel ghosts? This is the most insane, roundabout way of getting out of Dormamu’s trap and I am in awe of the thought process involved. Getting back to the quest to rescue Tippy Toe and her “pet” Nancy, we are joined by Drax the Destroyer who truly appreciates Doreen’s clear and direct way of communicating. The elaborate plan to defeat the “Silver Surfer” is very nearly as complicated and over the top as the one to beat Dormamu, but seeing Squirrel Girl stand up to the group of surfer-bro bullies is worth it, as always. The final reveal (and final uppercut) is going to pick a serious fight and may drive a wedge between Squirrel Girl and one of her newest and most powerful allies, however. Will Squirrel Girl, Nancy, Tippy Toe, Loki, Drax, and an entire planet of squirrels be able to withstand the coming wrath? God, that’s the best sentence I’ve ever had the pleasure of typing. Thanks, Ryan and Erica. This is the most insane, roundabout way of getting out of Dormamu's trap and I am in awe of the thought process involved. Loki isn't as devious when he's a good guy.